Honestly, I hadn’t researched much about this probiotic/prebiotic craze until a couple of friends pointed out that Kefir and Kombucha are rising in popularity. 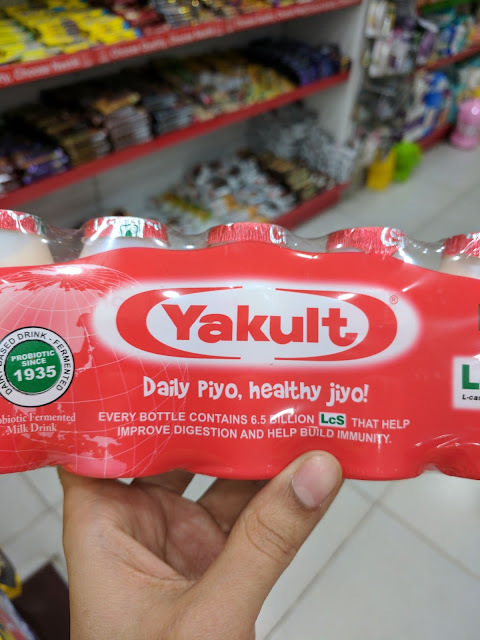 Let’s begin with a teeny tiny summary before we talk about Yakult. Probiotics are good bacteria that keeps your digestive system healthy by controlling growth of harmful bacteria. They help the intestines break down food. They boost our immunity, lowers the risk of colon cancer and increases the effectiveness of vitamins. Prebiotics are food for probiotics. They are made up of carbohydrates that your body can’t digest. They reach the large intestine without getting affected by the digestion process. Prebiotics such as fructooligosaccharides (FOS) and galacto‐oligosaccharides (GOS) are naturally found in many foods such as whole wheat, onion, garlic, cabbage, legumes etc. One of the best sources of probiotics is yoghurt. Pickles are also a great source. Fermentation process helps in producing probiotics. Probiotics are also available in the form of supplements that contain “live” bacteria. The important thing to keep in mind is that probiotics supplements aren’t regulated according to "drug standards" by the US FDA. There are chances of developing allergic reactions to the new bacteria being added to your body. Also, one needs to be careful when giving probiotics supplements to children under the age of 12. Coming to Yakult, it is a fermented milk drink that contains 6.5 billion probiotics called LcS (L-casei Shirota). LcS is Yakult’s exclusive probiotic strain. It comes in a pack of 5 plastic bottles with a price tag of Rs.60. Each bottle of 65 ml is therefore priced at Rs.12. Recommended serving is 1-2 bottles per day for all ages above 1 year. I have only 2 issues with this product right now. Let’s keep aside the thought whether the “exclusive” LcS probiotic strain is effective or not. It will need more time to research about its effectiveness. The nutritional facts table show that a single bottle (65 ml) contains 10 gm of added sugar, which means a whopping 2.5 tsp of sugar in each bottle. Why? Seriously why? To keep our guts clean, why do we need to pollute our planet? If a family of 3 drinks Yakult on a daily basis, how many plastic bottles will be disposed in a week, in a month and in a year? New-product innovators need to think hard, not just about their profitability and growth but also on the trash they leave behind on the planet. 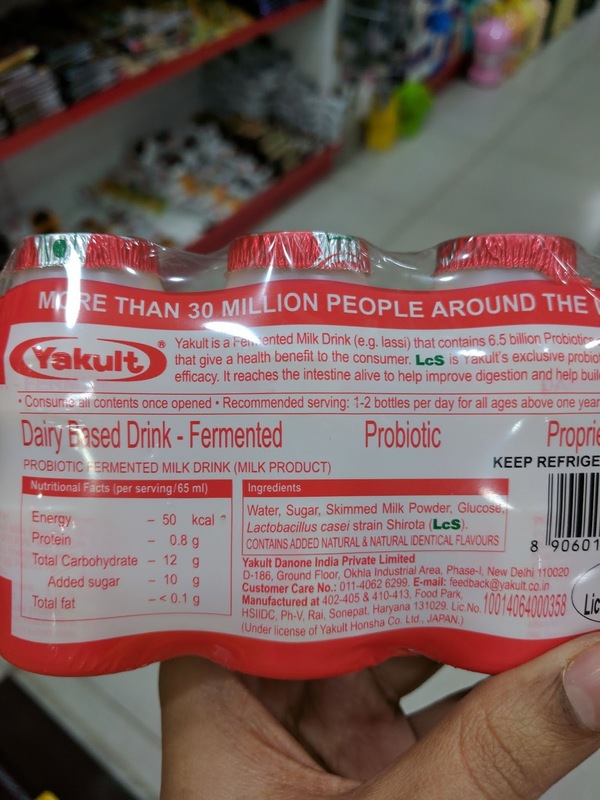 As I was googling about Yakult and LcS, I stumbled upon this brilliant article - 11 reasons to avoid Yakult and other probiotic drinks. Is there anything more to be said? Gut health is a “hot topic” these days. We have spoilt our gut flora (good bacteria) so much that we are looking for external, artificial quick fixes. How did we spoil our gut flora in the first place? Our ancestors never had to worry about probiotics. In South India, we use fermented batters all the time - idli, dosa, aapam etc. But what kind of breakfasts do we have these days - corn flakes, chocos, oats and what not? There are a huge variety of pickles that are made all over India. But we fear the oil and salt and instead, embrace sugar-laden probiotic supplements sold in plastic bottles. It used to be a daily practice to set curd at home. Now we have started to rely on packaged yoghurt, more so the “slim" version sold in plastic bags and containers. Unless we start to appreciate our country’s food traditions and practices, there will always be new “hot topics” introduced, along with fancy new solutions that come with a premium price tag. Do we need products like Yakult in the first place? Aren't we only treating the symptoms and not addressing the main issues? As for me, I’m content with my everyday “thachi mammu” (curd rice), idli/dosas made with homemade fermented batters and of course, pickles. And adequate lentils and vegetables to feed my gut flora. Very balanced and enlightening thoughts Anuradha! Good article Anuradha. My family too are Thachi mammu fans. But our pickles are not probiotic sources. They are not fermented pickles.